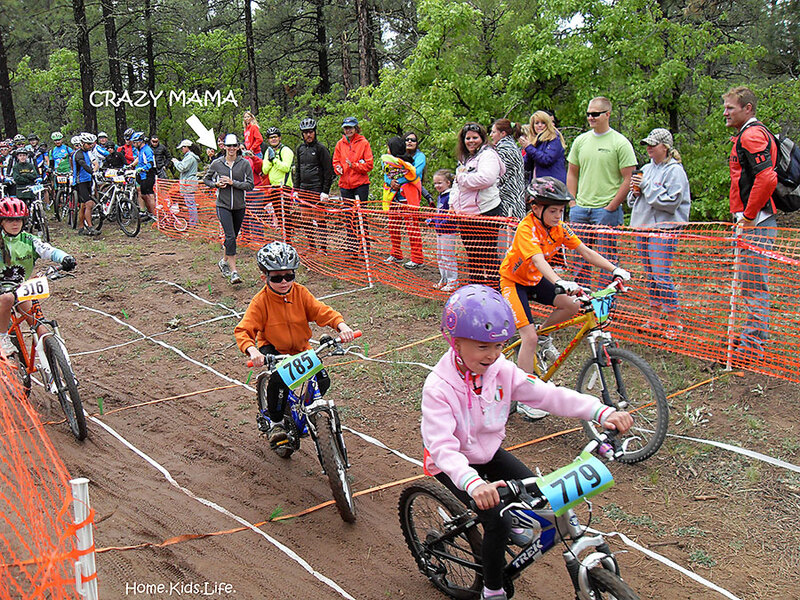 Okay ladies....how do you feel when your child races or competes in something? If you're like me, it's not the same as the dad feels. But you're probably not like me. And maybe you are. I'm sorry if you are. My boys signed up to do a mountain bike race this past Saturday. 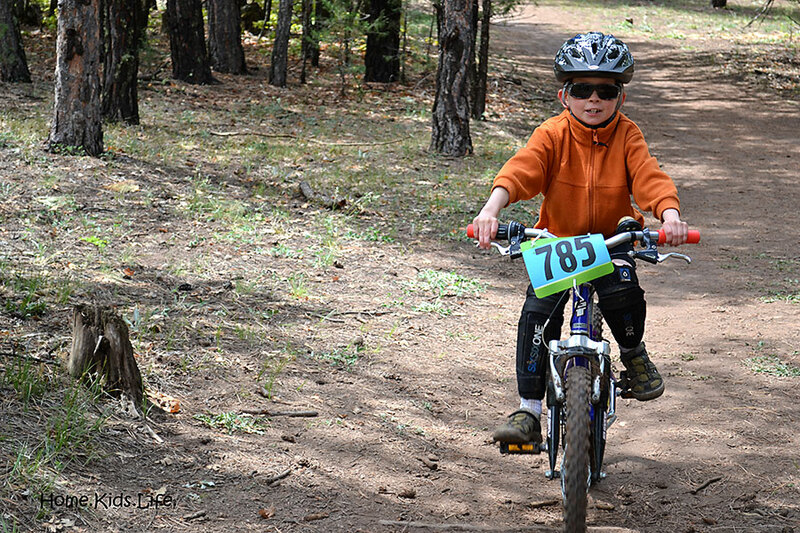 Biker Boy was stoked because it was not too far from our house and on some fast and fairly easy single track. Not too much rock climbing involved and a good starter course for our newest mountain biker (Scooter). 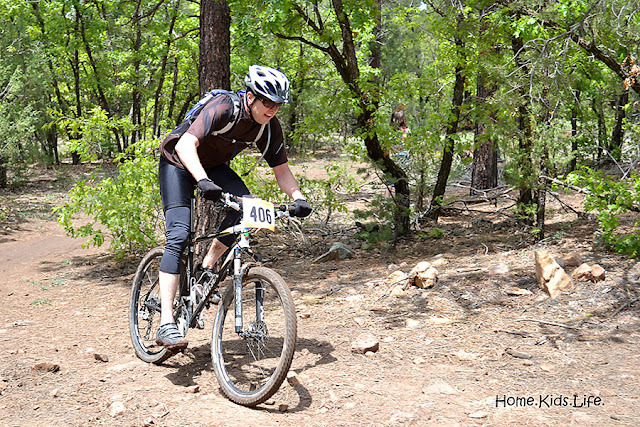 The course was also ideal for Biker Boy's hard-tail 26 inch bike as opposed to his full-suspension 29er. Ignore that last sentence if you don't know anything about mountain biking. It rained heavily the night before the race and we woke up to cloudy weather in the low 40's. Perfect. That's sarcasm in "perfect," since it's hard to read sarcasm. Did you get that? I actually was up at 5am with a case of butterflies in the tummy. And I wasn't even racing. Just a little history for you. I use to race mountain bikes (I'll gladly tell you now that I'm retired). Ask Biker Boy. I was horrible before a race. Nervous tummy, nerves galore...and just a wreck. Ask my parents about me when I was a senior on the swim team. Not pretty. And ask Biker Boy about when I was a senior on the college swim team (we were married then). Still not pretty. My mental capacities for competition were and still are pretty low. I loved practice, hated competing. Even if I was good at it. I could be the only woman in a mountain bike race (it's happened) and still have a case of nerves bigger than me. And you know what? It still happens even if I'm not the one racing. And no, it's not because Biker Boy is racing. He's fine. It's because my baby boy is. Yes...my baby boy is 7-years-old. I love that boy. I love Biker Boy too. I've watched my child do those parking lot kid mountain bike races where you can see your child from one spot the whole time. Totally fine with that. But this was a 1.6 mile singletrack dirt course with a rock drop and rock gardens. 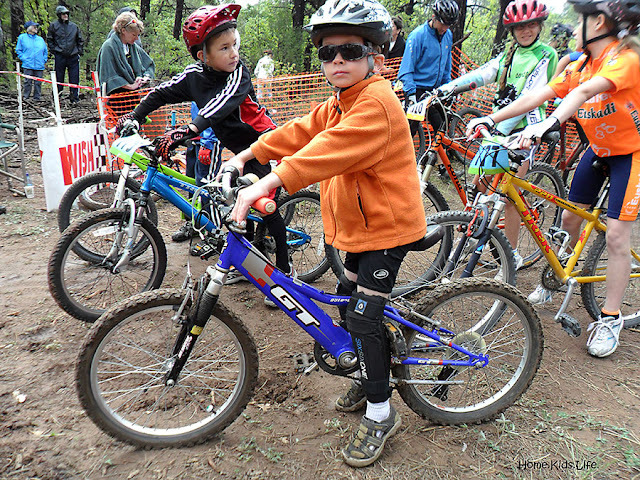 I use to mountain bike, so I know what my kid is getting in to. And I guess to be totally fair, it wasn't really a race. They didn't time it and all the kids got prizes (a cow bell, a sticker, a pin, and a free meal at Chick-Fil-a!!). I totally love that idea, it's a great way to get the kids involved. 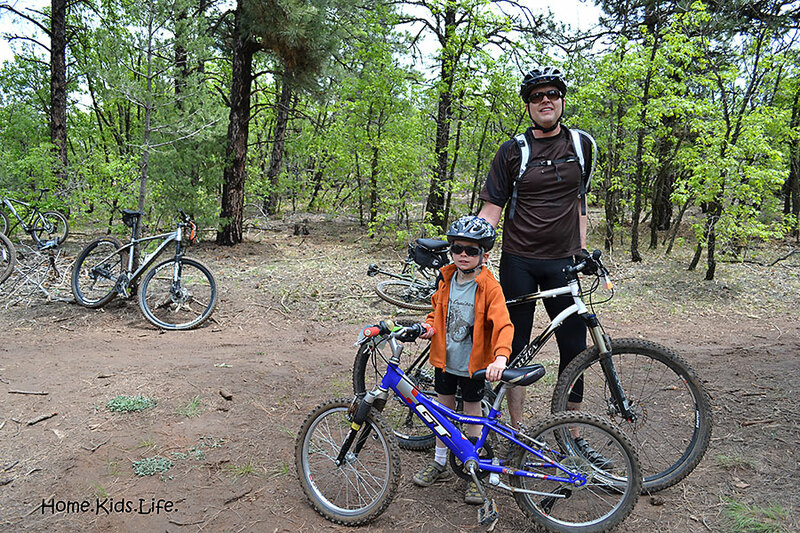 Mountain bike racing is truly a family event. Wish they did that "everyone gets a prize thing" for the adults. I'll take a free meal at Chick-Fil-A. Oh...and all the moms got flowers, though I didn't take any because I was either running the trail twice, trying to take pictures, or running kids to go potty. Thank goodness for grandparents being there to help out also and take some photos! We got to the race early and took Scooter on a trial run of the kids' course. I can not even explain how muddy it was. Biker Boy led Scooter on his bike and I ran behind Scooter. We had to stop and find sticks to push the mud out of his bike about 6 times. He got so much mud caked in his bike that the front wheel wouldn't even turn. I even attempted to carry that bike a few times and it must have weighed 60 pounds. My kid weighs 42 pounds. As Scooter commented, "This isn't what I was expecting." Me either. Biker Boy sums it up best when he said it was like riding on Velcro with your front tire being Velcro too. Oh, and I never let on to Scooter that I was super nervous for him. Hopefully he doesn't take after me in that area. So far, so good! They did the kids race first. All the 6-13 year old kids took off together. There was an adult on a bike leading them and an adult on a bike following. And then there was me running behind. Yes, I ran behind to make sure my kid was okay. He couldn't get his foot on the pedal and pretty much started off dead last. And I think because he was last he stopped and told me his leg hurt. I encouraged him on and he took off and passed a few people. Then I never saw him again until I got done running. 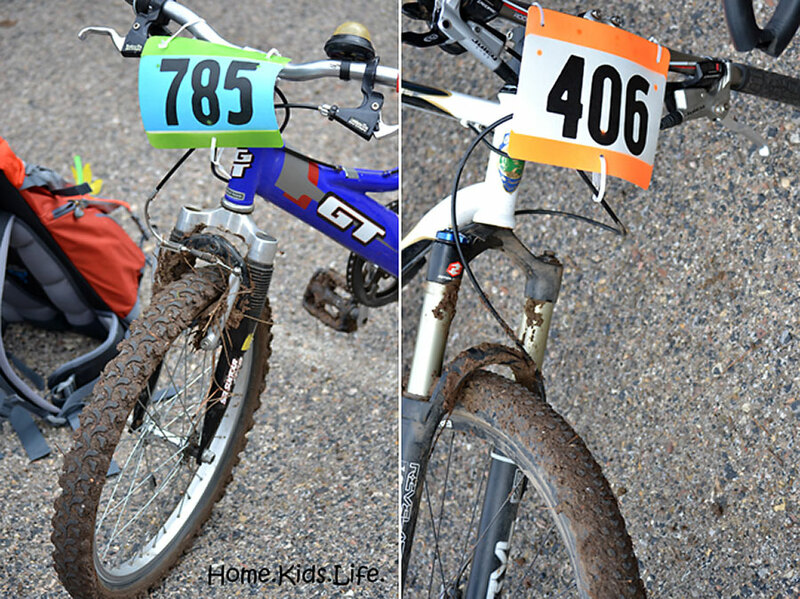 I cheered on a couple young girls who were having a hard time with the mud and even helped them with their bikes. 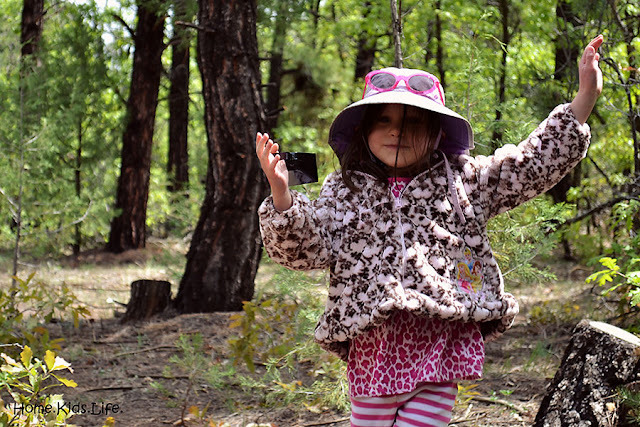 One little 7-year-old girl was trying her best to stay strong in front of me. When she saw her dad at the end, she just let loose with the tears. It's probably best I didn't see Scooter for most of the race...we tend to let down our guard around parents. They're the ones we can cry for. I hear Scooter did quite well and finished well. Good job little buddy! 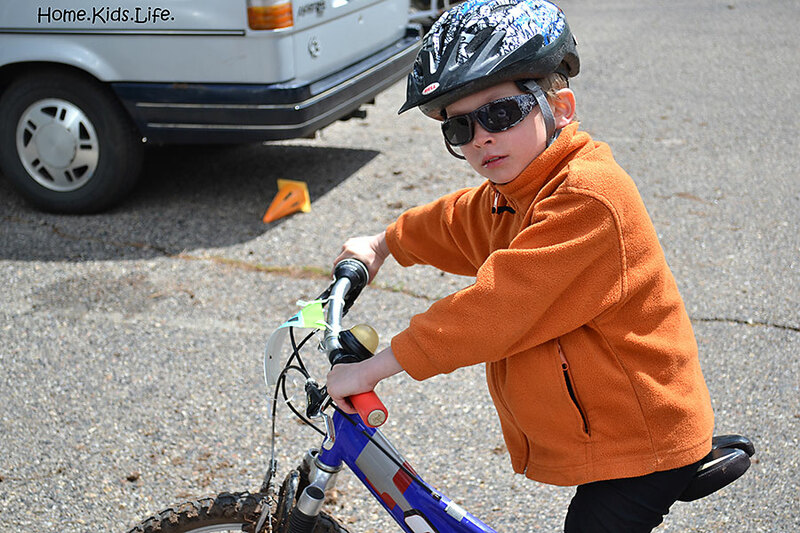 Biker Boy did awesome! We thought he got 4th and left before the awards ceremony, but it turns out he got third! Awesome job to my sweetie! He did a lot of miles! I'm so proud of both of my boys! So...how are you when family members are engaging in sporting activities? Or any other kind of friendly competition?